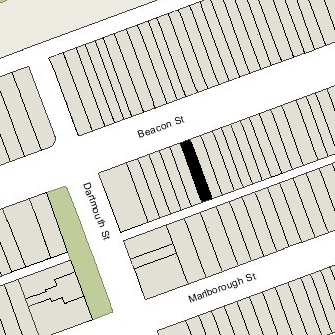 241 Beacon is located on the south side of Beacon, between Clarendon and Dartmouth, with 239 Beacon to the east and 243 Beacon to the west. 241 Beacon was built ca. 1868 for real estate dealer Henry Whitwell, for speculative sale, one of six contiguous houses (241-243-245-247-249-251 Beacon), designed as three matching and symmetrical pairs. 239 Beacon was built at the same time and in the same style; 253 Beacon (since destroyed) also was built at the same time and probably in the same style. Click here for an index to the deeds for 241 Beacon. By 1868, 241 Beacon was the home of Francis Winthrop Palfrey and his wife, Louisa C. (Bartlett) Palfrey. They previously had lived at 62 Chestnut. Francis Palfrey was an attorney and registrar in bankruptcy. He had served in the Civil War and was injured at Antietam, and was brevetted a Brigadier General in 1865. He founded the Military Historical Society of Massachusetts and wrote a book on the Antietam and Fredericksburg campaigns. By 1869, the Palfreys had moved to 202 Beacon. On March 12, 1869, 241 Beacon was purchased from Henry Whitwell by Cornelia Frothingham (Robbins) Fiske, the wife of attorney Charles Henry Fiske. They had married in June of 1868 and lived briefly at 36 Commonwealth with his mother, Hannah Rogers (Bradford) Fiske, the widow of Augustus Henry Fiske, before making 241 Beacon their home. Cornelia Fiske died in February of 1872, and Charles Fiske and their infant son, Charles, moved back to 36 Commonwealth to live with his mother. On November 18, 1872, 241 Beacon was acquired from Charles Fiske by his brother-in-law, cotton buyer and broker Brenton Halliburton Dickson. He and his wife, Mary Elizabeth (Fiske) Dickson, lived at 126 Marlborough. Charles Fiske retained a life interest in the property. On March 27, 1873, 241 Beacon was acquired from Brenton Dickson by Eben Rollins Morse. As part of the transaction, Charles Fiske relinquished his life interest in the property. E. Rollins Morse was a banker and broker. He lived at 153 Beacon with his parents, John Torrey Morse and Lucy Cabot (Jackson) Morse. He married in May of 1873 to Marion Ronaldson Steedman, after which they made 241 Beacon their home. 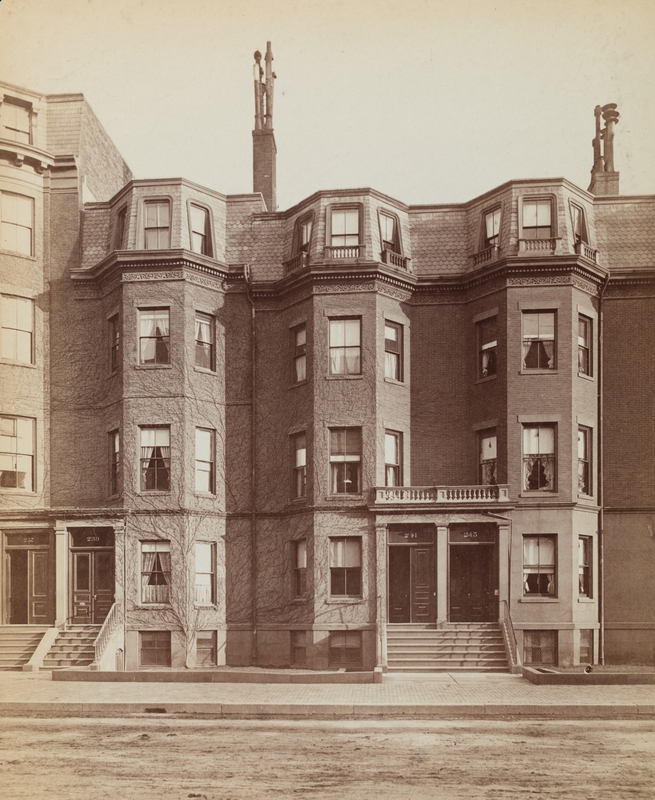 The Morses continued to live at 241 Beacon during the 1880-1881 winter season, after which they moved to the Hotel Vendôme by 1882, where they lived until the completion of their new home at 167 Commonwealth. On June 1, 1881, 241 Beacon was acquired from E. Rollins Morse by Julia Ward Howe, the widow of Dr. Samuel Gridley Howe. 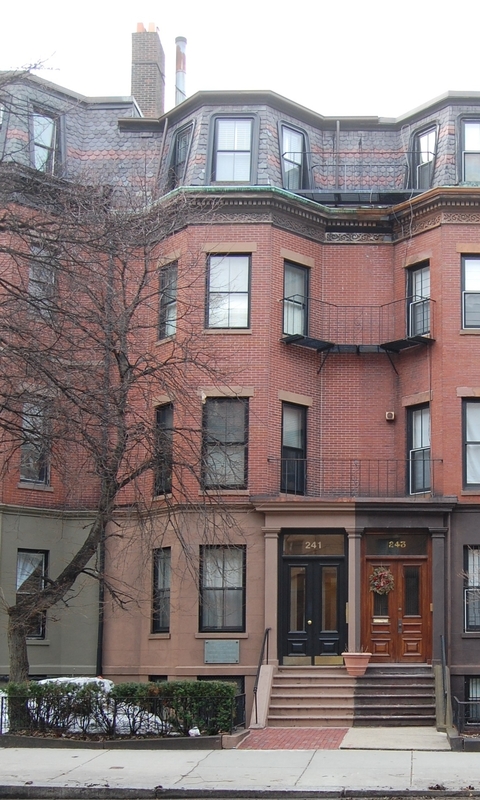 In 1880, she had lived at Benedict Chambers at 3 Spruce. Julia Ward Howe was a noted author and poet, probably best known for writing the lyrics to The Battle Hymn of the Republic. She also was an active abolitionist and, following the Civil War, became a leader in the Woman’s Suffrage movement. At the time she moved to 241 Beacon, she was editor of the Woman’s Journal with offices at 5 Park. Her husband, a physician by training, had been the founding administrator of the Perkins Institute for the Blind and was also a leader in the abolitionist and public education movements. During the 1885-1886 winter season, she was living elsewhere and 241 Beacon was the home of William Larrabee Bonney and his wife, Caroline Emma (Jones) Bonney, and their daughter, Avonia Bonney. William Bonney was employed by Jordan, Marsh & Company; Avonia Bonney was an opera singer, actress, and music teacher. By the 1886-1887 winter season, William and Caroline Bonney had moved to 4 Otis Place, and Avonia Bonney had moved to 5 Otis Place. By the 1886-1887 winter season, Julia Ward Howe had resumed living at 241 Beacon. During the 1888-1889 winter season, she was joined by her son and daughter-in-law, Henry Marion Howe and Fannie (Gay) Howe. He was a metallurgist and lecturer on metallurgy at MIT. They continued to live with Mrs. Howe in 1890, but had moved to 287 Marlborough by the 1890-1891 winter season. By the 1891-1892 winter season, she had been joined by her son-in-law and daughter, John Elliott and Maud (Howe) Elliott. They continued to live with her until about 1895. John Elliott was an artist and muralist who painted the Triumph of Time ceiling at the Boston Public Library. In 1916, Maud Elliott and her sister, Laura Richards, wrote a Pulitzer Prize winning biography of their mother. Julia Ward Howe continued to live at 241 Beacon until her death in October of 1910. The house was not listed in the 1911 Blue Book. On May 29, 1911, 241 Beacon was acquired from Julia Ward Howe’s heirs by banker Thomas Motley, Jr. He and his wife, Margaret (Fay) Motley, made it their home. They previously had lived at 247 Beacon. They continued to live at 241 Beacon in 1924, but had moved to Hyde Park by 1925. During the 1924-1925 and 1925-1926 winter seasons, 241 Beacon was the home of wool merchant Sidney Albert Eisemann and his wife, Helen English (Muhlfelder) Eisemann. They previously had lived at 29 Chestnut. They also maintained a home in Manchester. By 1927, they had moved to 371 Beacon. On July 26, 1926, 241 Beacon was acquired from Thomas Motley by Barklie McKee Henry. He and his wife, Barbara (Whitney) Henry, made it their home. They previously had lived at 4 Charles River Square. They also maintained a home in Manchester. Barklie Henry had authored a novel, Deceit, in 1924 (the year of his graduation from Harvard) and was managing editor of the Youth’s Companion for the Atlantic Monthly. They continued to live there in 1928, but moved soon thereafter to New York, where he became a banker. 241 Beacon was not listed in the 1929 and 1930 Blue Books. On March 31, 1930, 241 Beacon was purchased from Barklie Henry by Miss Sally Fairchild and her unmarried brother, Gordon Fairchild, a stock and bond broker. They previously had lived at 391 Beacon. John Singer Sargent was a friend of Sally and Gordon Fairchild’s parents, Charles and Elizabeth (Nelson) Fairchild. He made several paintings of Sally Fairchild and at least one of Gordon Fairchild as a child. Gordon Fairchild died in June of 1932. In 1933 and 1934, Sally Fairchild spent the winter season in Europe and 241 Beacon was the home of insurance broker Herbert Bramwell Shaw and his wife, Frances (Fairchild) Shaw. Frances Shaw was Sally Fairchild’s niece, the daughter of John Cummings Fairchild. By 1935, the Shaws had moved to 9 Hereford. Sally Fairchild continued to live at 241 Beacon until about 1945, when she moved to 1 Sentry Hill Place. By 1946, 241 Beacon was the home of Dorothy Thurlow (Moore) Burgoyne, the former wife of Frederick Walter Burgoyne. She previously had lived at 193 Beacon. She operated 241 Beacon as a lodging house, although it appears no change in legal occupancy was ever sought or approved. On April 28, 1950, 241 Beacon was acquired from Ray C. Johnson by Paul K. Pratt, and on December 23, 1954, it was acaquired from Paul K. Pratt by Vivian C. Sanford. 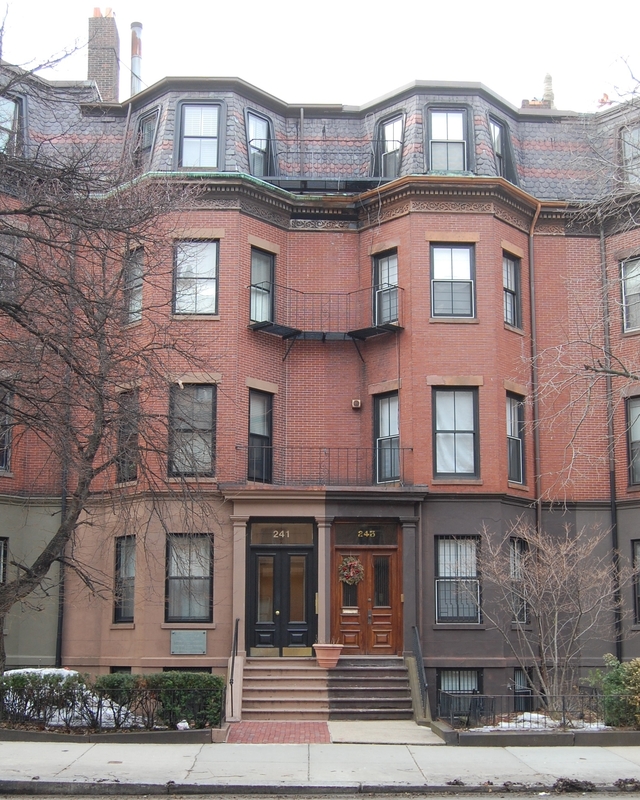 Dorothy Burgoyne continued to live at 241 Beacon and operate it as a lodging house, and on January 25, 1962, she — as trustee of the Beacon-Nahant Trust — acquired the property from Vivian Sanford. On April 18, 1973, she transferred the property to herself as an individual. She continued to live at 241 Beacon in the 1980s. On July 16, 1987, 241 Beacon was purchased from Dorothy Burgoyne by Stephen Cohen, trustee of the 241 Beacon Street Realty Trust. In November of 1987, he applied for (and subsequently received) permission to convert the house into five apartments. On the application, he indicated that the current legal use was as a single-family dwelling, but that it had been a lodging house with nine units for 37 years (since 1950). On September 12, 1989, he converted the property into five condominium units, the Julia Ward Howe Condominium.